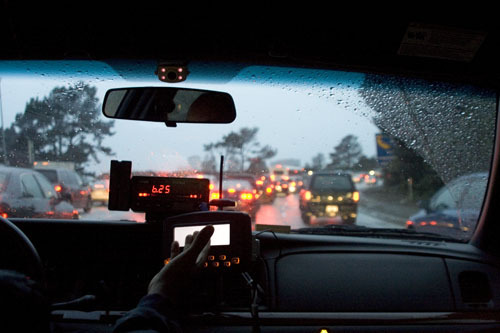 SF Taxi Media: Cabbies on Tilt. "Tilt" is a term that comes from the game of poker. Let's say you're in a poker game, playing confidently and well, making money. You get a great hand, you think you have the proverbial "nuts" and are unbeatable so you push in a big chunk of your chip pile. Another player is calling you, then raises you at the end, you go all-in and he suddenly and unexpectedly wins the hand, taking your huge pile of chips. You've had a "bad beat." Frustrated, you feel like you've been punched in the face, and as the game goes on you are thinking about how much you have to gain back, and you're making bad, reckless choices that cause you to continue losing even more money. A poker player in this state of mind is said to be "playing on tilt," and it occured to me that a similar thing is frequently experienced by cabbies. Maybe you've had a rude and repugnant customer in your cab. Maybe you're 30 minutes in a cabstand, the two in front of you get airports and you get a $4.90 short. Maybe it's hot and your A/C is on the fritz. There are lots of things capable of putting us on tilt, and we need to be vigilant. The important thing to bear in mind here is that the customer climbing into your cab right now bears no responsibility for your frame of mind. In the interest of garnering healthy tips and in just doing the right thing, we have an obligation to give every customer our best, which means a safe, smooth ride, conversation if they want it, and silence if they don't. How do we do this if we're already on tilt? Pull over and take a break. Take some slow, deep breaths, and reflect on how lucky you are to be driving a cab in the world's best cab city. Watch the sun come up, or go down. Have a healthy snack. Think about your smiling spouse, or your smiling dog. Do whatever you have to do to get your head in the right place for your next customer. The very act of framing a bad mental state as "playing on tilt" is powerful. It enables you to step back and objectivey see what's happening in your mind, and to more readily take steps to get back on track. (Gabriel Golden is a day driver with National/Veterans). I agree with your attitude on cab driving 100%. With you all the way, except for the unfortunate word that appears in the title and then pops up again halfway through. Long ago, I went public with my distaste for that cab driver-disempowering word. I greatly appreciate this new and vital way of sharing informations and feelings about the work that consumes most of our time.We get richer in the sharing. Thanks John for the info on the "Leaf" and Gabriel, as well as everyone who feels the inspiration! Luckily (maybe) my experience has been that for the most part customers, or fares, are demonstrably happy for our service, and rather, thoughtful about where our mind is or has been. Taking a breather is indeed helpful. Thanks for the help keeping our heads cooler out there, Gabriel, our Guardian Angel of the San Francisco Taxi Fleet. Welcome aboard!! !